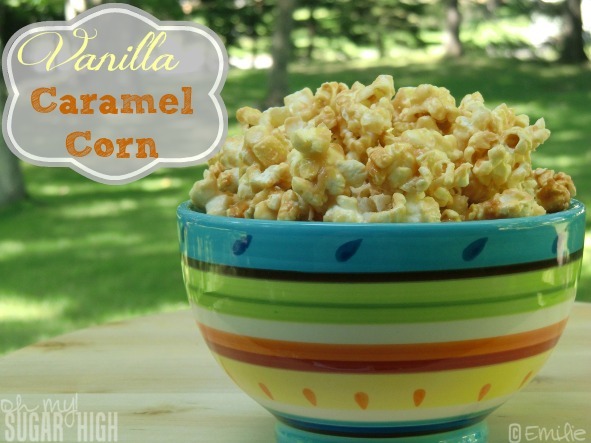 I’m in love with this vanilla caramel corn recipe from Taste of Home. If I could I would eat this stuff all day every day. Which is why I’ve added a warning in the title. I encourage you to make this recipe, you will not be disappointed. But please, proceed with caution. You just might find yourself having eaten all 28 servings in just a few days with two adults and two small children. Not that I know anything about that….ahem. 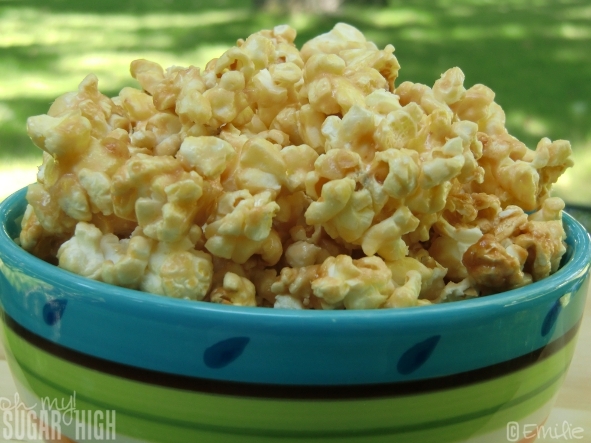 Pop microwave popcorn and pour into two extra large bowls. Be sure to pick out any unpopped kernels. 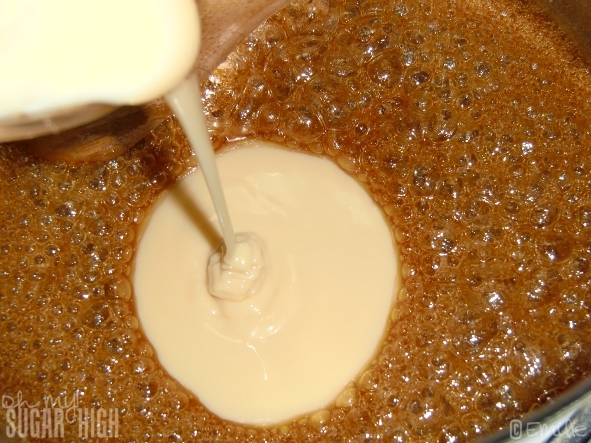 Bring brown sugar and corn syrup to a boil over medium heat using a large saucepan. Cook for 3 minutes, stirring constantly. 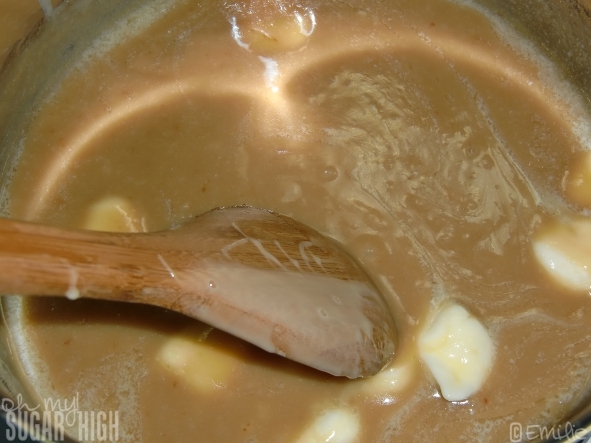 Carefully stir in sweetened condensed milk and butter. 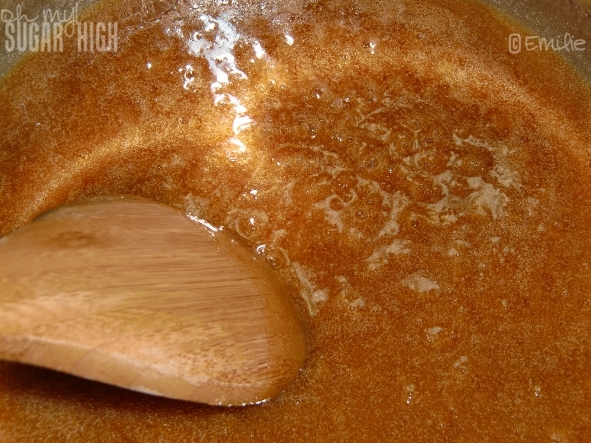 Remove from the heat then add vanilla and stir. 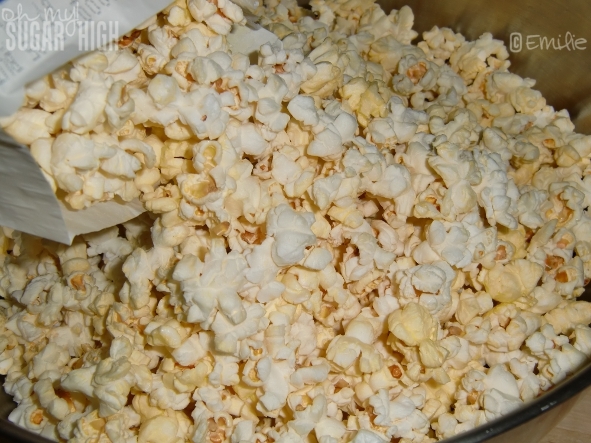 Pour over popcorn and toss to coat. 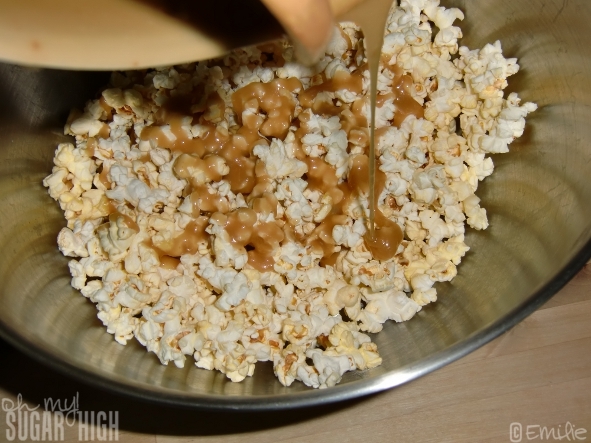 I layered popcorn and caramel alternatively to make it easier to mix. 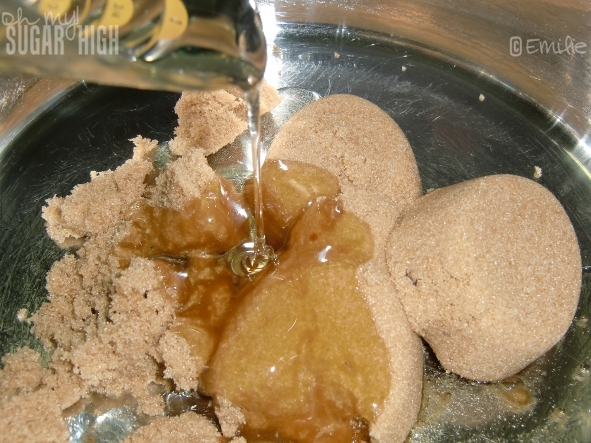 A great trick is to use a paper bag and shake to coat. Unfortunately I was out of paper bags and used a wooden spoon sprayed with cooking spray instead. Spread on greased jelly roll (15-in. x 10-in. x 1-in.) baking pans, keeping it a single layer. Bake at 250° for 40 minutes, turning halfway through cooking. 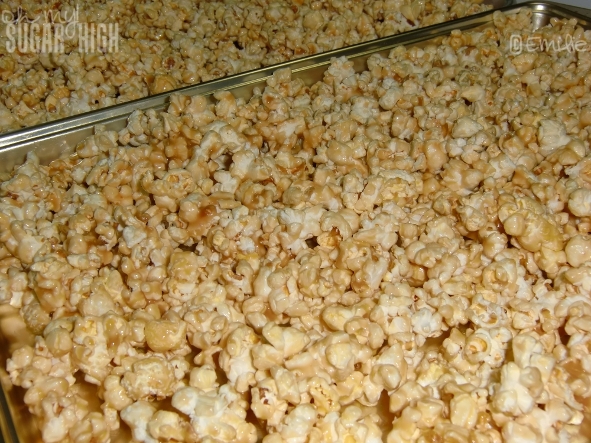 Remove caramel corn from pans and place on waxed paper to cool. Break into clusters. Use airtight containers for storage to keep it fresh. I wish you the best of luck keeping this caramel corn more than a couple of days! This would make the perfect snack for your next get together or a great Halloween treat! This recipe was featured in the Taste of Home Holiday Halloween Food and Fun book from August 2010. OK Emilie…. I SWEAR that I’m not trying to feed into your addiction (pun intended)…. ok, maybe I am. But that’s just because I don’t want to be the ONLY one who dreams of your caramel corn. I read the recipe, started drooling, and then instantly thought of what I’d do to kick it up one notch further (if that’s possible!). My fiance is a Crackerjackaholic (yes, that IS a word). So I will be adding honey roasted peanuts to your recipe. Then I’ll be praying to God to save my thighs from immediate expansion.